Tokyo, April 18, 2013 – Fuji Heavy Industries Ltd. (FHI), the maker of Subaru automobiles, today unveiled a Japanese specification prototype of its first hybrid model at the technical presentation event held in Japan. Introduced at the 2013 New York International Auto Show in March, Subaru's first-ever hybrid vehicle offers the brand's distinctive, enjoyable driving experience. 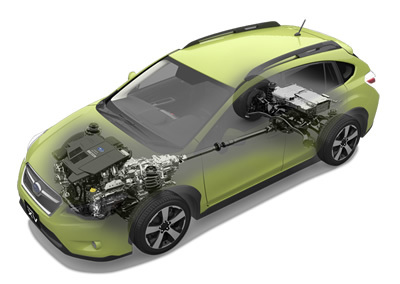 The components for the hybrid system such as a motor and a high voltage battery are installed while maintaining the Subaru's unique Symmetrical AWD layout. Thus a low center of gravity and superior weight balance remain the same as the gasoline model. By using a motor assist function, both enhanced fuel economy* and smooth acceleration have been achieved. This hybrid vehicle will be introduced to Japan market in early summer this year. The transmission was developed exclusively for the hybrid model. Based on the Lineartronic (CVT), a motor was installed behind the primary pulley. A 2.0-liter DOHC Horizontally-Opposed 4-cylinder gasoline engine was partially modified for the hybrid model, including reduction in engine friction. By compactly housing heavy parts for the hybrid system such as the high voltage battery under the cargo space, the overall front rear weight distribution and the low center of gravity were maintained at the same level as the gasoline model.